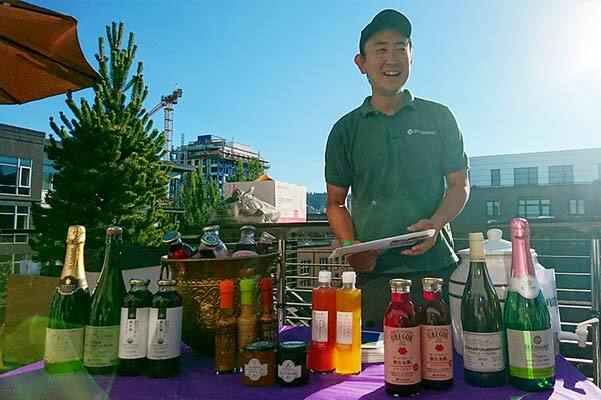 PORTLAND, OR On July 14, St. Cousair was a participant at the Japan-America Society of Oregon's 2017 Beer Garden, held on the upper level of the Ecotrust Building in the Pearl District of Portland. The Society is a non-profit organization established to promote mutual understanding by supporting cultural exchange and business between Japan, Oregon and the southwestern region of Washington State. Photos from the event are viewable on the Society's Facebook Page. The Beer Garden was attended by about 240 guests and all were very enthusiastic from start to finish. St. Cousair set up a booth to promote St. Cousair products, including the new sweet Drinking Vinegar, producted at SCOO's facility in Newberg. The booth's position was ideal, in that even those guests who were there just for the beer stopped by to try St. Cousair's products. Guests who sampled St. Cousair Drinking Vinegar remarked that they had never heard of Drinking Vinegar. They found it to be delicious, even if mixed with beer. Some of the guests suggested the Drinking Vinegar as a great mix with tequila. Popular as the Drinking Vinegar was, many guests were disappointed to learn that it was not yet available for sale in the US, despite it being produced locally. But hopefully, some day it will be selling in the US as well. St. Cousair and St. Cousair will do their best to make that happen.